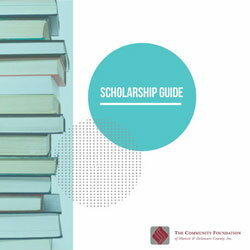 This scholarship guide was created by program staff at The Community Foundation of Muncie & Delaware County to provide guidance and tips to students who are applying for the Foundation’s scholarships. Scholarships at The Community Foundation are competitive. Writing essays, gathering activity information, and coordinating letters of recommendation can take a significant amount of time. We hope that this guide provides you with the tools to submit a scholarship application. The Community Foundation of Muncie and Delaware County utilizes a common application to match you to the scholarships you qualify for. Create your account, start your application, and answer some basic questions about yourself. When you finish, you will be directed to your dashboard. Your dashboard will indicate any follow-ups you take to complete your applications. These may include additional essays, letters of recommendation and short answer questions. Your dashboard will also It will also show you the scholarships that you have been applied to. You can sign-in anytime to complete your application or required follow-ups. If you are awarded a scholarship, additional action items will appear in your dashboard no later than May 11, 2019.